Indianapolis, Indiana – An Indiana patent attorney for Sherrill, Inc. of Greensboro, North Carolina (“Sherrill”) filed a patent infringement complaint in the Southern District of Indiana alleging that TreeStuff, Inc. of Indianapolis, Indiana infringed Patent No. 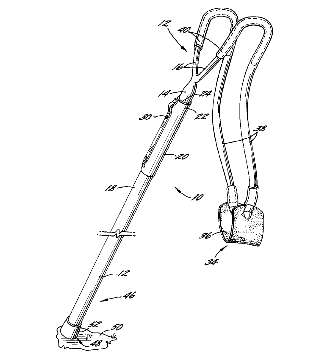 5,887,577 entitled “Apparatus for Propelling a Projectile,” which has been registered by the U.S. Patent Office. Plaintiff Sherrill asserts ownership by assignment to United States Patent No. 5,887,577 (“the ‘577 Patent”), which was issued to William T. Sherrill in 1999. It claims that TreeStuff manufactures, uses, offers for sale, and/or sells a product that infringes upon that patent, namely TreeStuff’s Stein Tekichu Throw Weight Launcher. In November 2014, Sherrill sent a cease-and-desist letter to TreeStuff. In that letter, it identified the ‘577 Patent, stated that the Stein Tekichu Throw Weight Launcher infringed upon certain claims of the ‘577 Patent and demanded that TreeStuff cease all infringing activities. Sherrill claims that TreeStuff did not respond to this letter but instead continued to use, offer to sell, and/or sell the accused product. Sherrill contends that, by engaging in these activities, TreeStuff has directly infringed, and will continue to directly infringe, at least claim 8 of the ‘577 Patent under 35 U.S.C. § 271(a) literally and/or under the doctrine of equivalents. Sherrill also suggests in its complaint that it is “reasonable to infer” that TreeStuff also intended to induce infringement. TreeStuff has also been accused of contributory infringement. Sherrill asserts that TreeStuff’s infringement has been and continues to be willful and deliberate. • Deem the case to be “exceptional” within the meaning of 35 U.S.C. § 285, entitling plaintiff Sherrill to an award of its reasonable attorney fees, expenses and costs in this action. The case was assigned to Chief Judge Richard L. Young and Magistrate Judge Debra McVicker Lynch in the Southern District of Indiana and assigned Case No. 1:15-cv-00346-RLY-DML.